Although I had done quite a few safaris at this point in Africa, none had been done in a really big national park until my trip into Chobe National Park in Botswana. 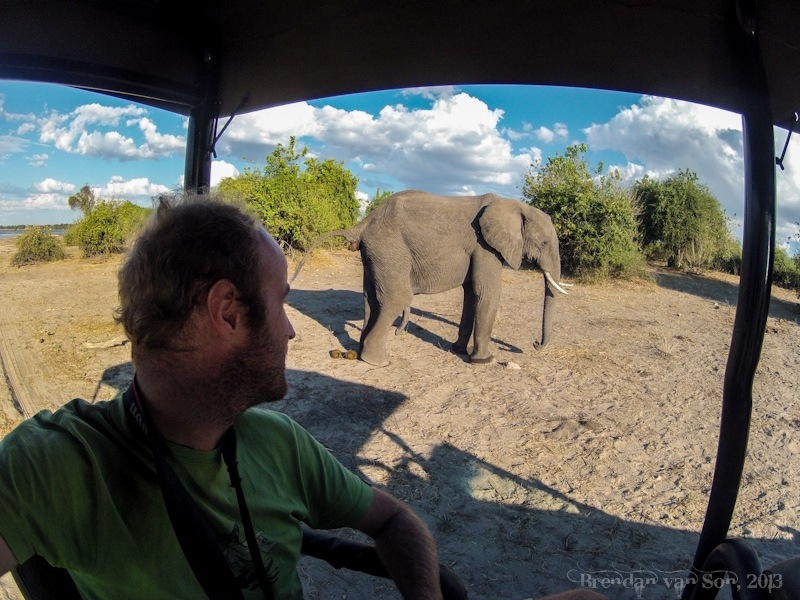 I went on a two day trip into Chobe National Park with a company called Kalahari Tours and it was amazing. The first day of the safari was split between a morning on the river cruise and an afternoon game drive. I felt pretty silly when I asked the boat captain to stop so I could photograph an elephant about 500m away when about 20 minutes later we were surrounded by as many as 50-100 elephants all within no more than a couple dozen meters away. In the river, there were also plenty of hippos, lots of bird life and even some Nile Crocodiles. The afternoon game drive was full of elephants again, but we also saw giraffe, baboons, loads of impala, and even a lion for a couple seconds. The second day of the Chobe safari was just a morning game drive. I hadn’t slept much the night before as we were out in the middle of the wild in the national park, protected just by our tents. I was out shooting images in the middle of the night, and there was a lion no more than about 400m away from me, although I could only hear it. Anyways, it was such an awesome safari in Chobe National Park, and the trip really set the tone for future trips. Following my trip to Chobe, I head off to Namibia via the Caprivi Strip. Stay tuned for that.